The Muscle Mania® programme is a ready-to-go preschool classroom based fine motor programme which runs twice weekly for the duration of the school year. Because the lesson plans are ready-to-go, it is easy to ensure they will be implemented regularly. And we know that regular implementation, means the children’s skills improve. 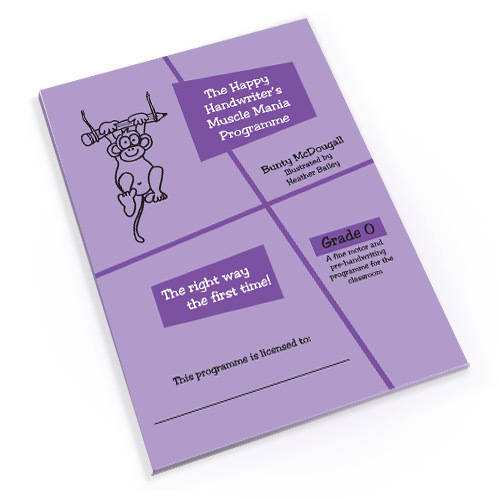 Because the children love Muggle the monkey and the Muscle Mania programme, it is easy to engage them in the activities and process. And this, together with the regular implementation, means their skills improve. Even if you have considered putting together your own fine motor classroom programme, it is hard to sustain. It takes hours of effort, not to mention trial and error. Occupational therapist, Bunty McDougall, has a passion for early childhood development and this, together with her special interest in fine motor and pre-handwriting skills, has resulted in a programme that works! I could not recommend the Muscle Mania Programme more. This is the 3rd year I will be running the programme and have seen such wonderful results. The positive feedback from teachers and parents alike is a testament to Bunty McDougall’s well thought out and graded programme. But most importantly the children LOVE it! The Grade 0 or Reception fine motor programme, consists of 64 half-hour lessons which are specifically designed and selected to focus on the development of the preschool fine motor foundations required for the development of handwriting. Muggle the monkey takes the children on an adventure through their school year, while developing and challenging their fine motor skills in a carefully graded programme that is CAPS compliant. The diverse nature of the programme includes both manipulatives and Activity Sheets. The Activity Sheets are all process orientated, with the focus on the muscles and movement patterns for pencil control and handwriting. They include graded cutting activities that promote muscle development, along with the planning and spatial organisation required to assemble the cut-outs. 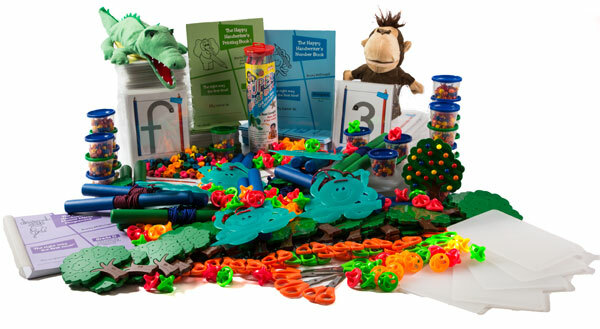 In addition, the programme includes folding, tearing, ruler work, letter formation (CAPS compliant), and development of muscles and movement patterns for pencil grip and pencil control. This is the ultimate fine motor programme! So, even if this programme has reproducible activity sheets, it is NOT a traditional worksheet based fine motor programme! Each Activity Sheet is transformed through manipulative challenges that extend and develop the children’s fine motor skills. No Reception year class can afford to be without this unique preschool fine motor programme which provides the children with the opportunity to prepare their fine motor skills for handwriting. The Muscle Mania® fine motor programme has reproducible rights for the license holder and comes as a 24 user programme with all the equipment (excluding stationery) to run the group in a class of 24 children. Our smallest package is a 10 User package but we do make the packages up to suit your class size. The Printing Book 1 and Number Book 1 are included in your package, but will need to be replaced annually. All other equipment is reusable. While these fine motor skills for preschoolers lesson plans have been designed for the Grade 0 classroom, it has been successfully run in Grade 1 classrooms in previously disadvantaged settings in South Africa. I launched the Muscle Mania programme at Bishops Pre-Preparatory school in January 2016 with the Grade R classes. I did so on request of the HOD, who had seen the benefits of the programme at the previous school where she worked. I have really enjoyed Muscle Mania, as have the boys and teachers. We can see so many positive results after only 6 months of doing the groups twice weekly. These include better pencil grip and control, steadily developing cutting skills, in-hand manipulation of small objects, finger strength and dexterity, to name a few. Bunty has done an outstanding job of combining fun, focussed work and skill development. She has put many years into developing and researching the activities and has crafted a thorough programme of skill development. Should you have a smaller class and are interested in 18 or 12, and any other sized user packages, click here to send the details of your requirements. Muscle Mania is an amazing programme. It has been carefully structured with clear goals in mind. The variety of tasks keeps the learners interested whilst achieving these goals. The impact on the learner’s fine motor development and organisational skills is tremendous. Muggle the Monkey helps to keep the lessons fun though his many adventures! Carron Cale, Grade R teacher, Bishops Pre Prep, Rondebosch.